"Space-Time for Springers" by Fritz Leiber. An intelligent kitten believes with every fiber of his being he's going to be a man, instead uses that gift to make a little bad girl good. Why couldn't this have been a Jerry Springer episode? It certainly had the elements. "The Game of Cat and Dragon" by Gordwainer Smith. 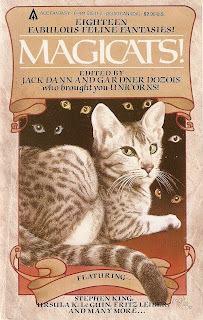 Telepathic humans and cats rid a ship of a psychic dragons. "The Cat from Hell" by Stephen King. A hitman is hired to take out a cat, only the cat has other ideas. Definitely a story worthy of Stephen King, only why hasn't it been turned into a movie? "Out of Place" by Pamela Sargent. People start hearing animals' thoughts and society goes down the toilet until the humans decide it's OK to kill off the "bad" animals. "Schrodinger's Cat" by Ursula K. Le Guin. I don't even know what happened in this story nor will I ruin my poor, pained brain to try to figure it out, even trying to explain what I think happened is too painful. "Groucho" by Ron Goulart. A script writer's partner dies, but he's got a way to bring him back. Kind of a funny story with a moral, leave the dead alone. "My Father, the Cat" by Henry Slesar. What do you do when your father is a cat and you want to reveal the truth to your fiancee? Etienne thinks about telling the truth, but does father know best? Cute story. "The Cat Man" by Byron Liggett. A man sets himself up on an island of paradise with cats which turns into an island of hell. I swear I've read this story before. "Some are Born Cats" by Terry and Carol Carr. Cats and aliens? Who would've guessed. "The Cat Lover" by Knox Burger. Odd story, didn't really care for it, but I think I read this one before, too. "Jade Blue" by Edward Bryant. Something about a catmother. The blurb before the story states the reader will know what a catmother is by reading the story; I still don't know what one is. "Tom Cat" by Garry Jennings. A nephew tries to trick his dotty aunt and others into thinking he's Puffpuss so he can inherit six billion dollars. Confusing and not funny. "Sonya, Crane Wessleman, and Kittee" by Gene Wolfe. A woman and a man meet and have dinner and then there's Kittee. I have no clue what this was about. "The Witch's Cat" by Manly Wade Wellman. A cat reclaims a home to call his own, taken by an old witch. Very cute story. "Antiquities" by John Crowley. Men are cheating on their wives with exotic women shortly after mummified kitties are used as fertilizers. Couldn't really follow this one. "A Little Intelligence" by Robert Silverberg and Randall Garrett. A murder takes place in a convent and Sister Mary Magdalena solves the crime with the help of her cat. Not really pleased with this story, especially the treatment of the cat. "The Cat" by Gene Wolfe. A spectral cat, I guess. No clue what this story was about. "Afternoon at Schraftt's" by Gardner Dozois, Jack Dann, and Michael Swanwick. A wizard bets his familiar he can conjure money, but something goes horribly wrong. This was actually the story to end this anthology on. there's a new Sherlock Holmes movie in the works. it's scheduled to premiere this coming Christmas Day. Iron Man is supposed to play him I think, right? Perhaps wikipedia could shed some light on the "Schrodinger's Cat" story in the novel. It's a pretty well known thought experiment in science fiction, and therefore right up Ursula Le Guin's alley. That might shed some light on what happens to the cat, to know the experiment the story is alluding to. If you like cat stories, there is one by Tad Williams titled "Tailchaser's Song" that I have read a few times; you might enjoy it.